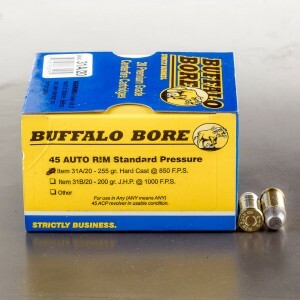 45 Auto rim ammunition is an extremely unique cartridge with a very interesting history. The round is very similar to the massively popular 45 ACP cartridge, but are not interchangeable in semi-automatic weapons. The 45 Auto Rim was created for a weapon created to meet wartime demands. The M1911 45 ACP pistol was adopted, but production by Colt and Smith and Wesson couldn't keep up with what the war effort demanded. Both companies had the machining ability to create revolvers at a rapid rate. So, both produced a Model 1917 revolver chambered in 45 ACP to aid in military logistics. 45 ACP lacks the rim necessary for a revolver to eject and chamber a round, so the 45 auto rim was designed to function in a revolver without the use of full or half moon clips. The half moon clips made reloading swifter, but where thin and often bent or broke in war time conditions. The 45 Auto rim cartridge was almost identical to the 45 acp round, except for the use of hard alloys for the bullet, and case strength. The 45 auto rim was entirely lead, which was softer, and aided in resisting wear in the shallow rifling of M1917 revolvers. The 45 auto rim featured a reinforced case that is much stronger than a typical 45 ACP round. This increased strengthened has allowed companies to produce hotter rounds, and squeeze every ounce of performance out of the cartridge. This is done to the point the round falls just short of the powerful 45 Colt. Want to take your .45acp revolver out for a couple of rounds but do not want to bust yout thumbs with a moon clip try these .45 auto rim rounds. I read of them several times and finally found them here. I grab a handful, went to the local clubs combat match and used them for the first stage. It was a stage of 2 + 1 with 8 ending in the center and 4 up top. The 8 in the center were grouped in about an inch, the 4 up top were just over a dime - all intersecting. The recoil was the same a standard 230 FMJ .45acp. I liked the ease of using the auto rim. I also discivered there are speed loaders for this round.